Here are five standout April Fools' pranks from carmakers in 2019. Let’s start with the least funny prank on the list. Sure, there are a lot of contenders for that, but we think the one by Jeep takes the cake for obvious reasons. Jeep’s Middle East Instagram came out with this ghastly picture of an ‘all-new Jeep sedan’ on their official page. It was apparent right from the go that it’s a prank. Just look at its shoddy proportions! 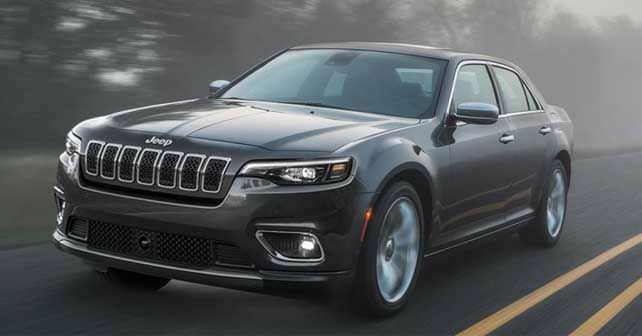 It seems that the company’s social media handler chopped a picture of the new 2019 Jeep Cherokee in half and added the rear half of the Chrysler 300 sedan to make it look funny. Which it isn't. All told, here’s hoping that we never see such a thing again – not even as a prank post! A sporty two-door convertible with rear-wheel drive was Hyundai’s idea of a prank for this year’s April Fools’ Day, and, truth be told, it’s not funny at all! Instead, it’s actually a very tempting prospect. The long hood, massive side intakes and the overall proportions of this imaginary N Roadster are right on the money. And we think no one will mind seeing this thing see the light of the day. But given the fact that Hyundai has already used it as an April Fools' prank, it's certain that they are not taking this one seriously. What a pity! In German, ‘Imker Honing’ means ‘Beekeeper Honey’ and ‘Komplett Geschminkt’ stands for ‘completely made up’. Quite funny and smart! This has to be the funniest of the lot. A Toyota Yaris Adventure pick-up truck was unveiled on April 1, and the manner in which Toyota described its vast range of capabilities was a dead giveaway that it was a prank. For instance, they said it’s an ‘answer to a question that no one asked’ and is ‘perfect for those who want to tell their friends they own a truck but never veer off the pavement.’ And there’s more, the Yaris Adventure with its 193mm ground clearance is also said to be ‘perfect for taking a curb in a mall parking lot or clearing the shrubs when parking in a friend’s front yard.’ Now while all of this is obviously a joke, it’s also an honest dig at the pseudo compact SUVs, which are actually a reality and sell in massive numbers. Full marks to Toyota for getting it spot on. Porsche’s first-ever electric vehicle, which is called the Taycan, is going to be launched by the end of 2019. Now, this all-electric Porsche will begin a new chapter for the Stuttgart-based sports car maker. So, naturally, Porsche decided to fool people on April 1 with a Taycan related prank. What the maker did was that they shared a new QR Code logo for the Porsche brand, and said that it’ll replace the original Porsche Crest, which was created in 1952, in the Taycan. According to Porsche, ‘the move shows that we are not only leading the way into the digital age, but we are also disrupting ourselves.’ It all sounded very serious – until people scanned the QR code on the logo and were redirected to a webpage that said ‘April Fools!’ in big and bold letters.